It began around 1981 when Hassan Sharif, a young fine arts student from Dubai, completed his foundation courses at the Warwick College and joined The Byam Shaw School of Art. From the beginning, Hassan expressed great interest in experimenting in art and showed heightened sensitivity and understanding of the avant-garde strategies and concepts that permutated the art community at that time. Once becoming acquainted with Kenneth Martin’s (1905-1984) Chance and Order theory, Sharif very quickly adopted it in his independent experimentations in drawings and Performance Art. The philosophical base for his art was, therefore, grounded in the British Constructivist movement, which focused strictly on inventing new means of generating forms. It is important to understand that Kenneth Martin, as the leading theorist of British Constructivism, devoted his life to defining the relationship between movement and construction as a means of generating a variety of sculptural structures. Martin’s most prominent student, Peter Lowe, also a sculptor, defined the scope of the research by focusing on the order of forms. These were also the times when Constructivism / Post-Constructivism was functioning rather as a component or an undercurrent of much larger and complex movement called Fluxus ("flow"). Fluxus, although having its origins in New York in the 1960’s, trickled down to Europe and Japan over the years and remained a vital framework for many artists for a period of at least two decades , in the 70’s and 80’s specifically. Fluxus, often described as an "intermedia" movement, allowed for the revolutionary widening of experimentations by including music, mathematical drawings, performance, happenings, and film. What is very interesting is that Hassan Sharif appears to incorporate into his art, first and foremost, the framework of British Constructivism, through the "experimental aspect of constructing" artwork primarily in drawings and in selected performances. He then converges into Fluxus in his performances, "flowing" with the movement and becoming its very unique and first representative in the Gulf region. In order to understand the role of the semi-system strategy in Performance Art, we need to grasp its role in the construction of the drawing. In the semi-system strategy, the directions of lines and the final shape of each of his abstract drawings is a result of very complex calculations based on randomly picked numbers, thereby allowing the element of unpredictability to take over the creation process. Ultimately, the artist utilizes chance to dictate the final outcome. Sharif concentrated on a multiplicity of facets of this "chance", ultimately proving its paradoxical limitations. Hassan Sharif started his experimentations with semi-systems drawings and continued their creation independently from his performances. He incorporated the semi-system strategy from his drawings into performances such as: Body and Square, Store III, and Body in a Store, all performed in 1983 in Dubai. Photographic documentation of Body and Square depicts the preparation sketches and the completed performance. The sketch and writing (top left corner) refer to the general plan of the performance as well as to the way it was documented. 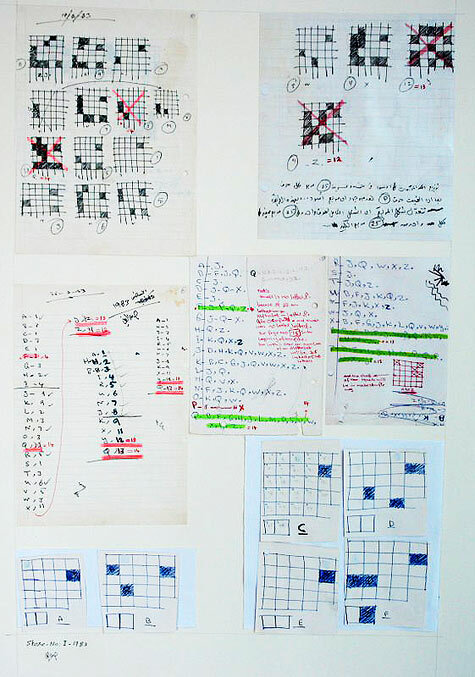 The drawing of the grid with filled-in squares (top right corner) refers to the outcome of the calculations based on chance and order theory. The result of these calculations identified particular squares that the artist’s body would be touching on the grid during the performance (series of photographs below). The size of the outlined 25 squares is 165 cm by 165 cm, the artist’s height. The performance aimed to find the way to cover as much area with the artists’ body in multiple combinations by utilizing the calculation of the chance and order theory. This performance is an example of a unique phenomenon of applying Constructivist theory to performance practice. It is also an example of one of the first-ever performances executed in the Gulf region. A series of these performances was carried out without audience. The performances were documented by color or black-and-white photographs taken by small group of assistants and close friends. The second example, entitled Store III (1983), offers an interesting illustration of the influence of the calculations that determine the adding and subtracting of objects to and from a store in order to achieve a presentation. This time the calculations are an integral part of the outcome and the creative process. The calculations appear on a large grid on the wall above the objects that are being moved away and brought back as determined by them. Each stage of the experimentation was carefully photographed, giving an insight into a changing view of the store based upon calculated chance. In the performance entitled Body in a Store (1983), the element of the grid as a three-dimensional structure exemplifies another creative interpretation of the system, but this time without mathematical calculations. The artist moves between the ropes tied vertically between the ceiling and the floor, shifting the position of his body among random objects accumulated in the space. Hassan Sharif established his theoretical thinking and expression in the medium of performance during a period of months between 1982 and 1983. These performances were the culmination of his earlier experimentations and they reflected a parallel creation of drawings that he executed with great intensity from 1979-1985. His contribution to Performance Art can be classified as historical in developing and widening the scope of this medium. Although there was no possibility to popularize the performance among a wider audience, something else of major importance took place. The artist says, "I am a nomad and the desert is my home. The desert is vast and can be dangerous, just like the ocean." It is not surprising that he picked the desert as the place for a series of his performances. Performances like Jumping in the Desert, Walking, and Digging and Standing all took place in Hatta near Dubai in 1983. They are among the first performances in which the desert provided a backdrop for Performance Art. They are also the first that were ever performed in a desert by a Gulf artist. The need to create a "magic link" between familiar places and an acquired form of expression brought the artist to the desert. "Children jump while playing…men jump from parachutes and people jump at the beach. (…) In this performance, I jump in Hatta desert. Many people jump in different ways. So why shouldn't I jump in a desert?" comments the artist on his performance Jumping in the Desert. Photographic documentation of these actions show us their simplicity and depict familiar everyday activities that appear to be out of place and meaningless. It is the meaninglessness of these performances and their artist-centered practice that reveal very strong Fluxus influences. "Fluxus artists used their minimal performances to highlight their perceived connections between everyday objects and art, similarly to Duchamp in pieces such as Fountain (1917)." Sharif tells us in fact something more: that as an artist he does not believe in inspiration, but is a great believer in improvisation. He is not afraid to open himself to impossible options and openly acknowledges his vulnerability as he reserves his right to create without restriction. Sharif is not afraid to venture out to familiar places with familiar actions and reconfigure them. Performances such as Swing, Throwing Stones, and Recording Stones, all from 1983, exemplify this very clearly. Photographic documentation and the minimal instruction drawing of the performance called Swing (1983) illustrate such a reconfiguration in process. The artist chants while on a swing. The stationary recorder captures the artist’s voice at low and high frequencies, depending upon the distance of the swing. The familiar aspect of the everyday is there, but presented in a different and unfamiliar dimension. The same happens in Recording Stones (1983) where Sharif was photographed bringing stones of various sizes to a desert and placing them in a particular order. Meaningless action as an "empty sign" has its own poetry and unsettling potential; it leaves a space for both the artist and the viewer to fill in a meaning. The major thrust of those of Hassan Sharif’s performances that were documented by assistants and close friends appears, to have come in 1983. These performances can be categorized in three stylistic groups: minimalist actions performed in a desert; performances uniquely linked to Sharif’s own mathematical drawings through the Constructivist framework utilized in the performance; and finally the group that deconstructs familiar meanings. Sharif’s efforts were very prolific in this very short period of time. The phenomenon of his art is rooted in the unprecedented fusion of Constructivist theory, avant-garde practice, and Middle Eastern spirituality. His approach and technique, especially in Performance Art, may have had origins in British Constructivism embedded in Fluxus strategies, yet the iconography and the reinterpretation of certain commonplace actions have a strictly Gulf region signature. Hassan Sharif therefore single-handedly created an original variation of Performance Art and has made a unique contribution as an experimental and performance artist from Dubai. Even without audiences he continued his art and remained faithful to his artistic beliefs. Soon afterward, he founded Al Marija Art Atelier in Sharjah in 1984 and later Dubai Atelier for Youth 1987 to promote contemporary art and pass on his knowledge and artistic credo. Art historian and independent curator. Lives in Warsaw, Poland, and New York, USA. Semi-System, constructivist drawings and Fluxus influenced performances in Dubai and the desert, early 1980s.